White stakes mark the out of bounds line along the right hand side of this hole and in front of the Clubhouse. If your ball goes out of bounds, you must play another ball, from the same place, taking a penalty. For example, if it was your third shot that went out of bounds, you will now be playing shot five (rule 27-1b). 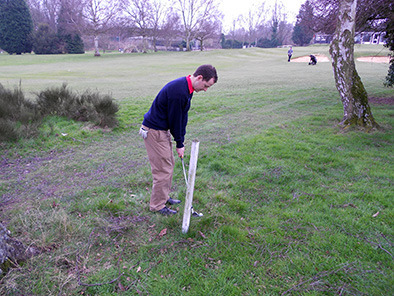 Occasionally, your ball may come to rest in an area where you are not sure if is out of bounds or not. •The whole ball must be out of bounds. •Where a line marks out of bounds, the line itself is out of bounds. 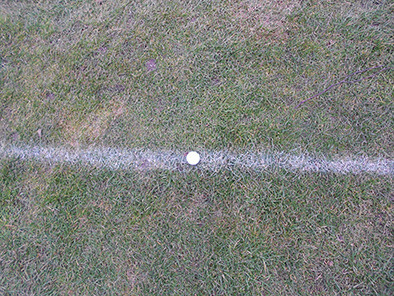 If your ball is on the line and no part of it is on the course, it is out of bounds. •When white stakes mark the area, out of bounds is determined by the innermost side of the stakes. Imagine a line drawn between the stakes; the line itself is out of bounds. Both of the balls in the photographs below are out of bounds. Note; you do not get relief from posts that mark the boundary of the course. 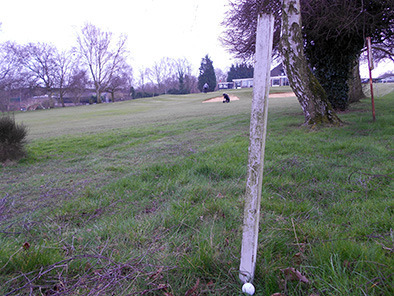 You cannot, therefore, remove a white stake if is interfering with your stroke or the line you want to play down. Any drop you choose to take will be under penalty.